Vice President Financial Consultant | Charles Schwab & Co. I have over 16 years of professional experience, in law and financial services, working with an exclusive list of Chicago area families, foundations, and endowments in matters of multi-generational wealth. Beyond traditional investment advice, my team and I consult families on analyzing their trusts, considering the impact of family law situations, and developing efficient tax strategies, to name few. Currently, I oversee approximately $500 million of assets under management. My clients include corporate executives, family-owned businesses, attorneys, philanthropists, and not-for-profits. As an attorney and a financial consultant, my clients look to me as their trusted advisor. They come to me seeking advice on a variety of legal issues ranging from family law, taxation, mergers and acquisitions, and real estate to name a few. 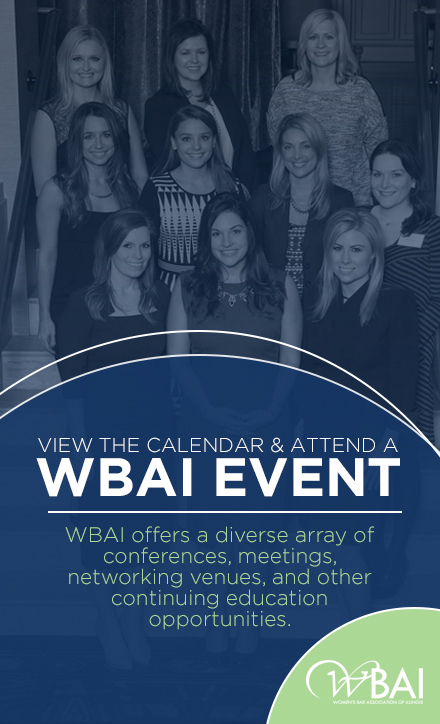 As an active member of the WBAI, this will allow me to develop a trusted network of top legal professionals to partner with and refer my clients to. Not to mention, build new friendships with professionals I respect and admire. Outside of work, I am active in Crossfit. This helps me maintain my sanity and destress from intense work days. I have a love/hate relationship with burpees. I’m also active in the LGBT community of Chicago by volunteering and supporting The Center on Halsted and Equality Illinois. Did I mention I love red wine? Co-chairing the Diversity Committee of the WBAI. I’m excited about developing some solid initiatives and events highlighting the diverse community of the WBAI and celebrating diversity in Chicago. I’m really looking forward to making a splash, having fun, and meeting some incredible professionals while rolling out programming that the members of the WBAI will find informative and valuable. I studied in Tokyo, Japan for nearly two years. While in Japan, I worked part-time at MTV Tokyo as an MTV VJ hosting the afternoon time slot and announcing the newest and greatest pop hits from America.